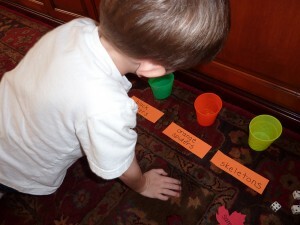 This is one of my favorite station activities because it was one of those moments where I realized that I could take an item, alter it a bit from it’s original intended use and create activities with it to build skills and find out what Andrew knew. I purchased a package of Halloween rings (either from Target or Michael’s, cannot remember) and used my scissors to cut off the ring part. (I don’t know about you but those rings were never very comfortable and I knew that Andrew would never wear them.) This left me with black and purple bats, black and orange spiders, and skulls (or skeletons). I decided that I would have him sort these pieces and then count them. 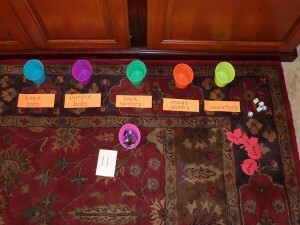 I got out the colorful Easter egg dying cups for him to sort into and wrote a label for each one so that he would see the words that went along with the item (color and object). I strategically chose a certain amount of each one and placed those in a container ready for him to sort. Station set up and ready to go. Once at the station, he sorted the items. Andrew talking about what it is and where it should go. 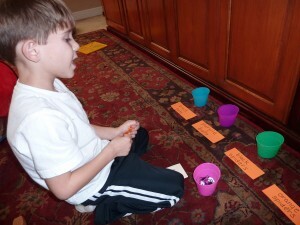 When he was done sorting, I had him count how many of each. 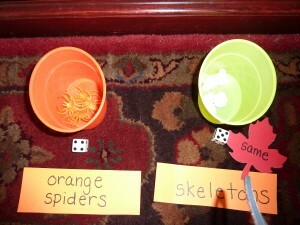 We used some dice to represent the number of items in the cup. We then decided which group had the most, the least and checked to see if any were the same or equal. Close up of labels, rings sorted and dice representing number of rings in the cup. This was a favorite station for him and it has been modified throughout the years to work on addition, subtraction, patterning. This year it will be used to build multiplication and division skills (which is simply making “equal groups of”).